^ "Big Ambitions Serious science : Annual Review 2013–14" (PDF). Sciencemuseum.org.uk. Retrieved 10 March 2015. 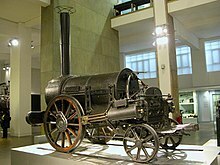 ^ "Science Museum | British History Online". British-history.ac.uk. Retrieved 10 March 2015. ^ a b c "Museum history". About us. London: Science Museum. Retrieved 24 June 2016. ^ Encyclopædia Britannica. "Science Museum (museum, London, United Kingdom) – Britannica Online Encyclopedia". Britannica.com. Retrieved 7 July 2010.